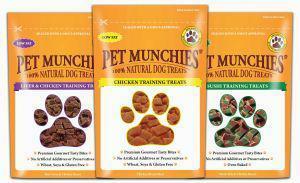 Pet Munchies mixed selection dog training treats, premium gourmet tasty treats, made from the finest ingredients. Each mixed pack contains - 4x50g Chicken, 4x50g Sushi 4x50g Liver and Chicken. Give as a reward or simply for pleasure, ideal for dogs and puppies over 3 months. Chicken Training Treats 50g - NEW 100% Natural: Quality Real Chicken Breast. These premium gourmet tasty bites, made from the finest ingredients, make the perfect training aid. Delicately baked to perfection in their own natural juices. Give as a reward or simply for pleasure. Great for pups and dogs of all sizes. Naturally low in fat. Wheat, Soya and Gluten free. Sushi Training Treats 50g - NEW 100% Natural: Quality Real Fish & Chicken Breast. These premium gourmet tasty bites, made from the finest ingredients, make the perfect training aid. Delicately baked to perfection in their own natural juices. Give as a reward or simply for pleasure. Great for pups and dogs of all sizes. Naturally low in fat. Liver & Chicken Training Treats 50g - NEW 100% Natural: Quality Real Beef Liver & Chicken Breast. These premium gourmet tasty bites, made from the finest ingredients, make the perfect training aid. Delicately baked to perfection in their own natural juices. Give as reward or simply for pleasure. Great for pups and dogs of all sizes. Naturally low in fat. Wheat ,Soya and Gluten free. Pet Munchies are Delicious, Nutritious and Wholesome… all made 100% Natural just like nature made them, with natural textures, flavours and exceptional palatability dogs love. Today's consumers are demanding natural healthy products for their pets. And that's what you'll get with Pet Munchies - the brand you can trust.